The version of SharePoint you're using dictates the type of top-level site or subsite you can create. The selection of site templates that are available to you by default depends on the features set up by your administrator and the Office 365 or SharePoint Server plan you have. You may also be able to create and use custom site templates. Note: If you have a site or subsite you don't need anymore, see Delete a SharePoint site or subsite. 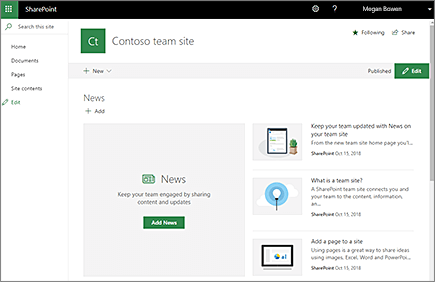 By default, SharePoint Online and SharePoint Server 2019 offer team sites for collaborating with members of your team or those working together on a project and communication sites for sharing news, reports, statuses, etc. with others. When you launch SharePoint and click + Create site, you'll have a choice between one of these two templates. Note: Your administrator can enable or disable site creation, or substitute custom or classic team site creation. 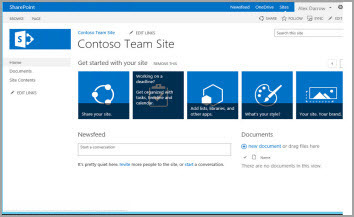 To learn more about SharePoint Online and SharePoint Server 2019 team sites, see Create a team site in SharePoint or What is a SharePoint team site? 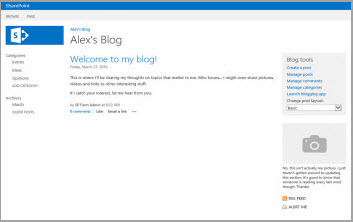 For communication sites, see Create a communication site in SharePoint or What is a SharePoint communication site? Once you've created a top-level team site or communication site, you can create subsites. Subsites let you use a wider range of templates, such as classic team, publishing, blog, or document center sites. The descriptions below will help you choose the template you need. Note: SharePoint Online top-level sites, such as Team or Communication site are not available as subsite templates, only as top level sites. 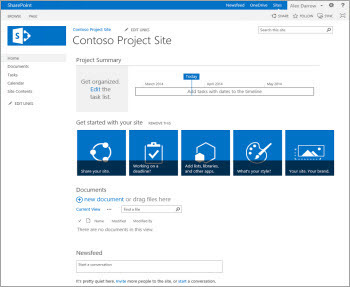 SharePoint Server 2019 offers new Team sites as subsite. In SharePoint Online, you can create subsites with classic templates only. The publishing tab is only available when you enable the SharePoint Publishing Infrastructure, and only as a subsite from a top-level, group-connected team site. The publishing infrastructure and publishing subsites are not available on top-level communication sites. When you create a subsite from a group-connected team site, the subsite can inherit permissions from the parent site and members of the team will have access. Some SharePoint Online top-level site features will not be available on classic subsites, such as Move to and Copy to. With SharePoint Server 2013 and 2016, you can create top-level sites or subsites using the below classic templates. The following descriptions show the availability of templates based on the version and plan of SharePoint Server you're using. SharePoint Server 2013 Foundation only supports Collaboration Team sites and Blogs. It doesn't support any other templates. Collaboration site templates create sites where you can communicate information about your team and projects, create a blog, or a community site. All are supported on SharePoint 2013 and 2016, and as subsites in SharePoint Online. 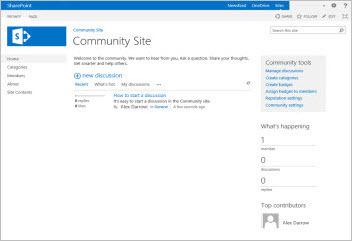 For SharePoint 2013 Foundation, only Team sites and Blogs are supported. SharePoint Server 2019 offers modern team sites as subsites, but with no connection to an Office 365 Group. 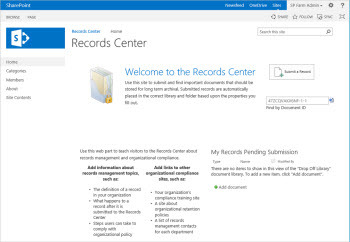 For more information, see What is a SharePoint team site?. A team site can be used as a single environment to create, organize, and share content. For example, use the announcements list to broadcast key information, new tools, or resources to team members. Use the calendar to share scheduling information, like team events, deadlines, or vacations. You might also try the Links list to help your team connect with partner sites or find key information for their jobs. Note: For a SharePoint Online subsite, using the team site template creates a classic team site. Visual timeline of the project’s tasks. For more info, see Create a project site. Note: Creating a sub site using the communication site template under a community site is not supported. For more info, see Create a community portal. Enterprise site templates give you sites for document or record storage and tracking, Business Intelligence for data analysis, or site-wide search capabilities. All are supported in SharePoint 2013 and 2016, and as subsites in SharePoint Online or SharePoint Server 2019 unless otherwise noted. . None are supported by SharePoint 2013 Foundation. For more info, see Use a Document Center site. Note: Creating a sub site using the communication site template under a Records Center site is not supported. For more info, see Create a Records Center. 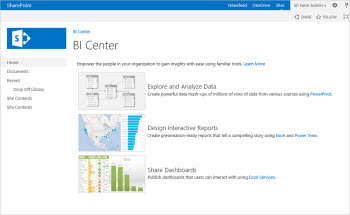 For more info, see Create, share, and consume BI content in a BI Center site. Use the Search Center site to provide a way for users to search the site and view search results. A Search Center site is the top-level site of a site collection that a farm administrator creates by using the Enterprise Search Center or Basic Search Center template. When you create a Search Center site a default search home page and default search results page are created. Also, if you used the Enterprise Search Center template, pages known as search verticals are created that can be customized for searching specific content, such as people, conversations, and videos. These pages display search results that are filtered and formatted for a specific content type or class. 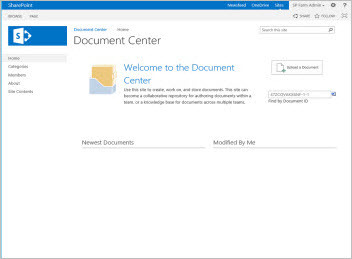 For more info, see Manage the Search Center in SharePoint Online. 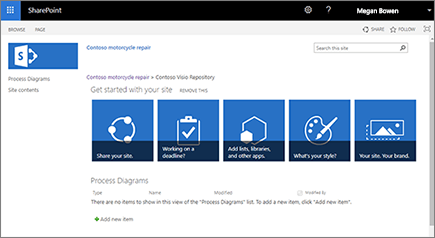 A Visio process repository is a site for viewing, sharing, and storing Visio process diagrams. It includes a versioned document library and templates for Basic Flowcharts, Cross-functional Flowcharts, and BPMN diagrams. To create publishing subsites, your administrator first needs to enable the SharePoint publishing infrastructure. Once enabled, the Publishing tab will be available. All are supported in SharePoint 2013 and 2016, and as subsites from SharePoint Online or SharePoint Server 2019 Team sites. None are supported by SharePoint 2013 Foundation or as subsites on SharePoint Online or SharePointServer 2019 Communication sites. 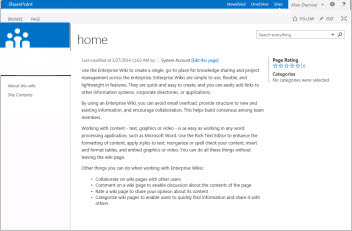 For more info, see Features enabled in a SharePoint publishing site. For more info, see Work with a publishing approval workflow. An Enterprise wiki is often a repository for an organization's knowledge, which otherwise might not be saved for future use. You can use an Enterprise wiki to promote informal learning and share tips with other users, which can reduce the need for formal training or continuous IT support. For more info, see Create and edit a wiki. SharePoint Online tenant administrators can use the Admin Center to create new site collections. When creating a new site collection, you can choose a classic template to use for a new top-level site. You can't however create a group-connected team site or communication site. The selection is similar to templates available for SharePoint Online subsites. When the site starts, you need to configure users, permissions, format, content, and many other features. For more info, see Create a site collection.